Coach Chot Reyes was all smiles while dancing when News 5 interviewed him few days ago during the PBA Chairman's ball in Pasay few days ago. That was his first on screen interview after the 7th place finish of the Smart Gilas Pilipinas Men's National team in the Incheon, Korea Asian Games 2014. 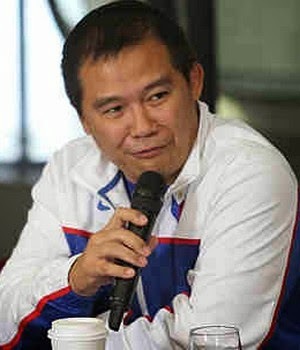 By the looks of it, it seems that Coach Chot has already accepted the harsh comments of the Pinoy Fans. "One of the objectives when I took the Job as the head coach of Gilas was to get to the FIBA World Cup 2014, to rekindle the passion of the country. And, when you rekindle the passion, part of that passion is hindi lang puro happiness meron ding hatred. So FOR ME OK NA YON AT LEAST, PEOPLE NOW CARE ABOUT THE NATIONAL TEAM," Reyes said. "Wala na akong mahihingi pa sa Gilas dahil naibgay na namin ang lahat ng aming makakaya. Ang biggest lesson was to prepare enough for the international tournaments," he added. Coach Chot also touched on the possibility of Coaching Gilas 3.0. "Sa ngayon nasa kamay nalang ng PBA Board at Samahang Basketball ng Pilipinas (SBP) kung magpapatuloy ako bilang national team coach," disclosed Reyes. "And for the people who have stopped rallying behind Gilas because of what happened in the Asian Games, then you know, I understand, Godbless," he highlighted. After that, Coach Chot and the rest of the Gilas players and TV 5 head officials watched the Documentary "A Nation's Passion" which is about the 4 decades of PBA's history.